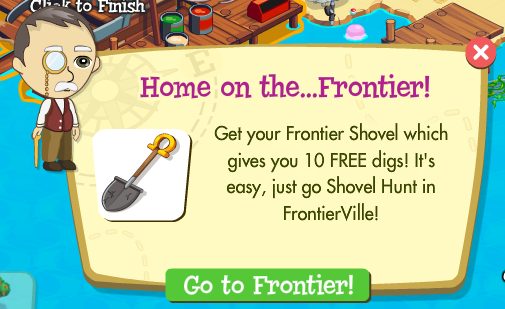 While it's not better than getting 10 free energy, the newFrontier Shovel from FrontierVille is an exclusive item that lets you make 10 free digs in Treasure Isle. But what it technically does, is make each of your next 10 digs require 5 less energy. 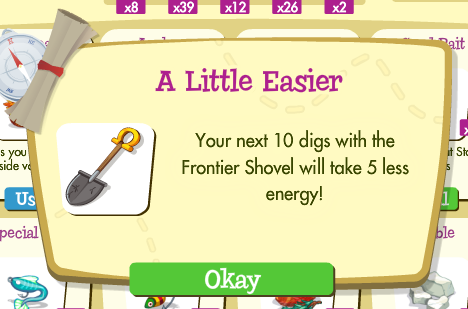 And since each dig takes 5 Energy, well, you get the idea. And they're really heavy with the emphasis on the digs, because that's all you can do with it. You can't cut trees or ferns or search a lodge with it. You can spend 36 Horseshoes to unlock this, but it's not worth it. They're also such simple tasks that you'll be better off just completing the goal the way it asks you to. 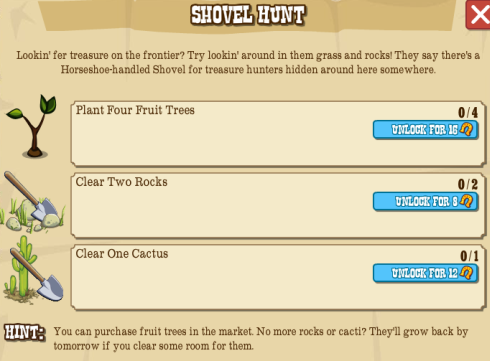 After completing the goal, you get 50 XP, 250 Coins, and a Horseshoe-Handled Frontier Shovel.